Stalwart Investment Advisors | What makes Wonderla Holidays an amazing business? What makes Wonderla Holidays an amazing business? What is the idea of a full-day outing/picnic for an average Indian middle class family? Think about it, what are the entertainment options available for a family even in Metro cities on weekends or when you have some relatives visiting you from outstation? I bet the first thing that would come to your mind would be- visiting a mall, watching a movie and then having a nice meal at the food court. That sounds good and that is precisely what everybody around seems to be doing. The only issue there could be lack of decent content which you can watch with your family. Other than that, what else comes to your mind? Think about full-day enterntainment options for an average Indian family. Frankly not many exciting options exist that are ‘fun’ and at the same time ‘affordable’. That is precisely what got us attracted to this space. An amusement park provides a great avenue for full-day entertainment for an entire family at an afforadable price point. Now you must be thinking that amusement park industry in India must be very large and profitable. However that is not the case yet, India’s amusement park industry is not very old as it started with Appu Ghar in Delhi in 1984, followed by Essel World and Nicco Park in Mumbai and Kolkata respectively, established in 1990s and is still in the expansion phase. The size of the amusement parks industry in India is estimated to be just around Rs 2,600 Cr. with around 150 amusement parks in India. In terms of footfall, Indian amusement parks industry is quite undersized as compared to some of large global amusement parks. The industry witnesses an annual footfall of around 5.8-6 Cr. Footfall depends primarily upon the size, location and offerings of the parks. As India experiences hot climate almost 7-8 months in a year, water parks are a popular format. Surprsingly, almost all of these 150 are standalone parks run by some regional entrepreneur and none of these are run professionally with an ambition to be a large amusement park business; some came up just because there was surplus land and owner didn’t know what else to do with it and in some cases the idea could have been to just get tax entry, as it is a cash business. The result? Parks fail to meet guest expectations of cleanliness, hygiene, safety and regular addition of innovative rides to get repeat footfalls. Subash Chandra of Zee fame started Essel World in Mumbai but never expanded it as focus was always on multi-billion dollar media businesses. Mr. Kochouseph Chittilappilly, promoter of V-Guard Industries, identfied this potential in Amusement park industry and opened first park in his home town Kochi in 2000 by the name of Veegaland (later renamed as ‘Wonderla’). He was probably the first Indian entrepreneur to tap this opportunity in a professional and ambitious way. Later on his son Arun Chittilappilly joined and opened second park in Bangalore in 2005. The company came up with an IPO in 2014 to fund third park in Hyderabad which was recently launched in April 2016. They are already scouting for land in Chennai and expects to open their fourth park by 2018. The vision of Wonderla is to be a pan India player. In FY16, the two operational Wonderla Parks received a footfall of 23 lacs translating into revenues of Rs 205 Cr. and net profit of Rs 60 Cr. ; yes thats a 30% net profit margin. 1. Customer Delight: This could be a classic Peter Lynch type find, all you need to do is visit any of their parks once. When you hear the kids and their parents screaming out of excitement and thrill, you realise the company is actually selling an experience. As per Trip Advisor rankings, their Bangalore park is #1 thing to do in Bangalore out of 230 things and #2 thing to do in Kochi out of 138 things to do. In Asia ranking, Bangalore park is ranked 7th best park, whereas Kochi park as 13th best park in whole of Asia. 2. ‘Value for Money’ Experience: Entry ticket for Wonderla park which includes both land as well as water rides costs Rs 900-1000. Inside the park, everything is available at MRP. So for a family of 4, the entire experience costs about Rs 5000 making it afforadable for middle class. They can easily charge premium for in-park sales of food and beverage like PVR sells popcorn at Rs 200 and everybody is forced to buy, however the management chose to make it a worthwhile experience for its visitors and keep competition at bay. Wonderla drives 80% of its revenues from entry fees, as against global average of 33%, which implies there lies a huge opportunity to tap these revenue streams like F&B and in-park resort. It opened its first resort at Bangalore park in 2012 and within three years it reached a 50% occupancy. 3. First Mover Advantage, existing parks are Cash-Cow: Wonderla owns the finest assets in its industry which have been built at a very reasonable cost. If one were to develop such parks today, the cost would be at least 5-10 times of what Wonderla incurred. Primary reason for this is the incessant run up in land prices over the last decade. If a new entrant decides to spend less on land acquisition by going 50km far from city, then he loses big on the footfall. Whereas, if he buys expensive land, then he would have to offer tickets at a much higher price. A low cost asset allows Wonderla to charge low entry fees and make it a ‘value-for-money’ offering for its visitors which would not be possible for any new entrant. 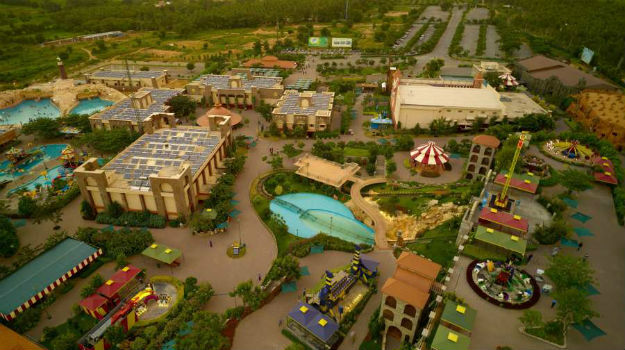 Adlabs recently opened a theme park in Pune expressway at a capital investment of 1,650 Cr. Wonderla’s investment on Hyderabad park was contained at Rs 250 Cr. This allows Wonderla to expand using internal accruals and without resorting to heavy debt. The management has guided to open one new park every 3-4 years using internal accruals. 4. In-house ride manufacturing facility leads to lower capex and maintenance cost: To leverage the operational experience in the amusement park industry, Wonderla has developed in-house manufacturing facility in Kochi to construct rides for their amusement parks. They introduce new rides and attractions based on their study and understanding of customer preferences, the popularity of existing rides and attractions at their amusement parks as well as the research done by their key employees by visiting amusement parks in other parts of the world. They have a team of qualified staff working at manufacturing facility in Kochi. Wonderla has manufactured 42 rides and attractions out of the 121 that have been installed at Bangalore and Kochi amusement parks. 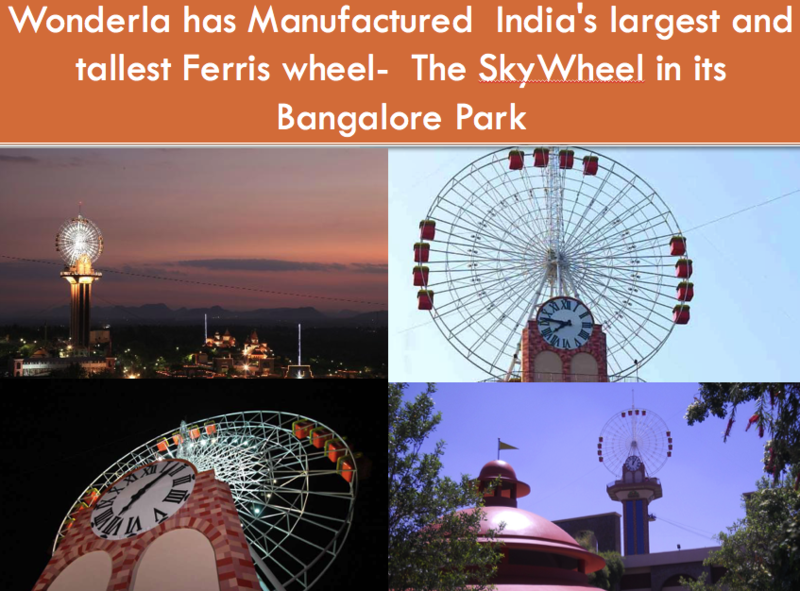 Wonderla even holds a patent for the invention ‘vertical drop amusement ride mechanism with varying load counter weight brake’. According to management, cost of in-house manufacturing is one-third the cost of imported rides. We believe this is a significant competitive advantage as it allows Wonderla to manufacture rides in-house which would have been otherwise imported at three times the cost and also leads to low down-time and low maintenance translating into lower operating expenditure (opex). 5. Finest processes for Safety, Hygiene and Maintenance: Wonderla has a team of over 260 technicians who conduct daily, weekly and shutdown maintenance work using various tools like Checklists. In order to reduce carbon foot print by conserving conventional energy resources, Wonderla uses solar energy to heat water for all water based rides during winter. Wonderla follows highest standards of safety which is evident from the fact that both Wonderla Kochi and Wonderla Bangalore have been certified by Bureau Veritas Certification (India) Private Limited for meeting the BS OHSAS 18001: 2007 safety standards and ISO 14001: 2004 environment protection standards, in the operation and maintenance of their land and water based attractions as well as for the related amenities. Wonderla is one of the only 2 amusement parks in India to implement such safety standards. 6. Top Quality Management: Currently the team is led by second generation Mr. Arun Chittilappilly who seems to be an intelligent fanatic; has been to almost every big park in the world and is very ambitious in making Wonderla a pan India player. In terms of ethics and corporate governance, the V-Guard group is one of the best in the country. Having established multiple businesses from scratch, Mr. Kochouseph Chittilappilly is not only a very successful entrepreneur but also an extremely responsible citizen reflected by his contribution to society; he had donated his kidney at an age of 60+ to a truck driver to support organ donation drive and initiate a chain reaction across the country. Rising Footfalls: Daily average footfalls at existing parks is 3,300 whereas the capacity is to entertain 12,000 guests daily. Since it is a fixed cost operation, this offers a huge potential for operating leverage. In last 10 years, footfalls have been growing at a CAGR of 10%. Realization per visitor: Wonderla Kochi park was launched with ticket prices at Rs 100 and Bangalore park at Rs 250, today these are at ~900-1000, courtesy ~10% annual price hikes which wonderla has been taking. Going forward, even a 5-7% price hike will offer good operating leverage. In last 10 years, realization per visitor has grown at a CAGR of 10.6%. Sales-Mix: Tapping other low hanging fruits like F&B and resorts to increase their contribution to revenue. New Parks: In FY17 Hyderabad Park is expected to add Rs 65 Cr. to revenues and by 2018 Chennai park will also come onboard. Thereafter, one new park every 3-4 years can be added. Capital Intensive: It is true amusement park business is capital intensive as a lot of money goes into acquiring land and installing those expensive rides like roller coasters. However, this fact alone is not enough to rule out the opportunity, its important to see the kind of return on capital employed this business can generate. If that is reasonable, then we might have found a money spinning machine which is better than businesses that are asset-light and generate high RoCEs but do not have reinvesment opportunity and hence are forced to distribute it as dividends. Looking at 40% RoCE of existing parks may not be correct as these are low cost, old and depreciated assets operating at decent utilization levels. So, lets look at Hyderabad park which has come up at an investment of Rs 250 Cr. Management expects 7 lac footfalls in first year at an average realization of Rs 900, so revenues of ~Rs65 Cr. and operating costs of Rs 35 Cr., generating an EBITDA of Rs 30 cr. It will probably just break-even or post a minor loss due to high depreciation and low utilization in first year. What happens from third year onwards when footfalls reach 10 lacs at an average realization Rs 1,100, it not only generates decent profit but also post 15-20% retrurn on invested capital, which will keep expanding as utilization picks up further. Though most of these assets are being depreciated in 5-7 years, many have life span of over 15-20 years. The other way to think about this is, due to large depreciation expense they pay substantially lower taxes and yet get to deploy all that cash flow for opening newer parks. Accidents: This is more of a perceived risk and at least till date actual occurrence of such incidents has been low. In its entire history of 15 years, Wonderla has had nine accidents in its premise, out of which seven instances led to loss of life. Five of these were caused by Cardiac Arrest as revealed by medical reports. Wonderla has taken accident insurance policy for employees and their spouse and visitors to insure all of them against any kind of accident on their premises.Till date, Wonderla has paid an aggregate compensation of Rs 4.60 lakhs in case of three accidents that happened at their amusement parks. Nothing compared to Disneyland: Lot of people who have been to Universal Studios or Disneyland compare Wonderla with those giant parks which leads to obvious conclusion that this is nothing in front of what those parks are offering. The thought process there could be either that tomorrow when big global players come to India they can kill Wonderla or it could be that those who have been to international parks would never even visit these parks. Either ways, we think there is no comparison at all. Disneyland is a ‘theme’ park charging over $100 for entry and is attracting international tourists, whereas Wonderla charges $15, serves middle class domestic tourists within a radius of area of ~250km. Many of these families are visiting an amusement park for the first time. Even if Disneyland comes to India their target audience would be absolutely different from that of Wonderla. Wonderla doesn’t want to be Disneyland, niether do they want to be Six Flags of US, they have developed their own unique strategy which is to cater to an ever growing Indian middle class family and offer an affordable yet exciting and safe entertainment avenue. We think given the opportunity in Amusement park space and the management quality, Wonderla Holidays could be an amazing opportunity not just for next 3-4 years but for next decade or even longer. This could be one of the best proxies on the demographics of India, on rising per capita as well as disposable income. Nothing from China can disrupt this story, nor any tech start-up. People talk about virtual reality and 7D etc, but nothing can substitute the experience and the thrill of riding a roller coaster or sliding into a pool from 100-feet height. Disclaimer: This is not a recommendation to Buy. We and our clients hold shares of Wonderla Holidays. Read complete disclaimer here. Interesting and deep analysis of Wonderla H. I am holding this stock since last year and adding more. Hi Jatin, enjoyed reading your writeup and analysis, thank you! As a long-term investor, how do you see the capital intensity going forward? Land prices in new locations may not be cheap despite the demonetization. Won’t the return ratios and break-even period of new parks be considerably inferior? What is the contribution of land cost in the total outlay for Hyderabad park?